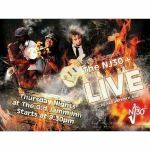 NJ30 is a 4-piece jazz band with a mix of swing, bebop, Latin and fusion – a repertoire to please all ages. Featuring Joseph Callender on saxophone and Kweku Jalani on trumpet backed by the Nj30+ Band. Members are Mark Forde (steelpan), Marius Charlemagne (upright bass) and Melvin Alick (drums). The Old Jamm Inn is next door to the premises previously occupied by the Ship Inn.